"A thing of beauty is a joy forever." So Keats declares in the first line of Endymion (1818), and never has a poem so succinctly expressed the exquisite loveliness of the binding it is found within, here an eleven on the 1-10 Drool Scale. 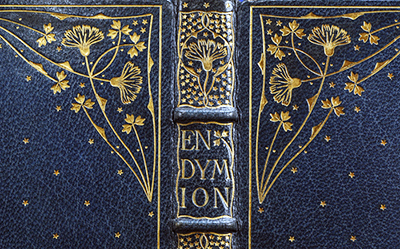 Bound by The Doves Bindery in 1894, this binding is a masterpiece of Arts & Crafts hand-work. In full prussian blue morocco with a single gilt fillet frame and corner design of carnations, three-pointed leaves, solid triangular tools, and gougework enclosing a field of tiny gilt stars, its design is handsomely elegant, an aristocratic nature walk under a starlit dusk. The compartments possess massed stars and alternating carnation and leaf centerpieces. 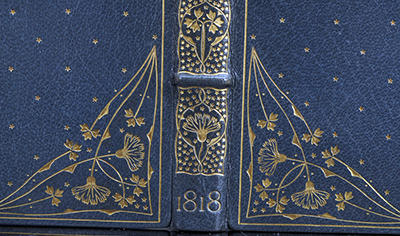 "1818" is tooled in gilt at the spine foot. The turn-ins feature leaf corner-pieces and triple fillets. All edges are gilt, with gauffered borders. Thomas James Cobden-Sanderson (1840 – 1922) was an English artist and bookbinder closely associated with the Arts and Crafts movement. 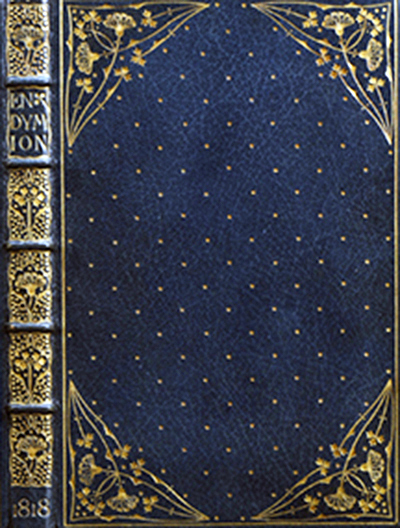 A friend of William Morris, Cobden-Sanderson was passionate about the movement, and once, during a dinner party with the Morrises, he was persuaded by Morris's wife, Jane Burden, to pursue bookbinding. He was a natural. He was an artist. He wildly succeeded. Ten years later he gave it up but in 1894 he opened a workshop, The Doves Bindery, at the urging of Morris. In 1900, he established the Doves Press, one of the most celebrated of the era's private press movement. The hand-work is breathtaking. The field of stars, for instance, is tooled with a degree of precision usually seen only with block-stamping. Each star is delicate but not weak. Charles McLeish was the fiinsher at The Doves Bindery, carefully following Cobden-Sanderson's instructions and patterns. Cobden-Sanderson's artistic attention to detail is obsessive: he designed gauffered borders to each of the gilt edges. It's a very subtle touch, easily overlooked. 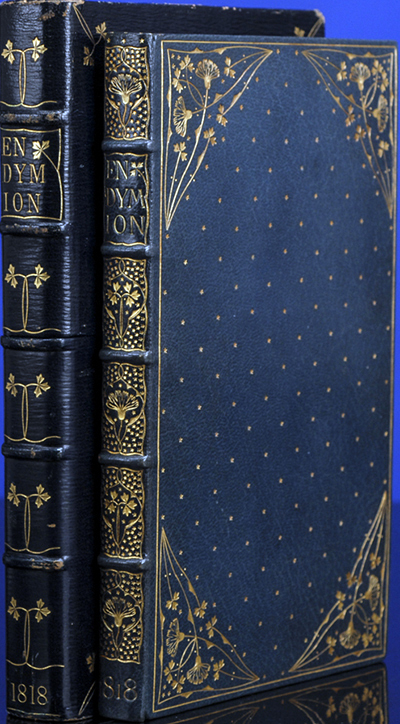 George William Gwynne performed the bindery's edge gilding, either on the premises or at his own shop. It should be noted that these gauffered edge-borders were not recorded in Tidcombe's descriptions; space precluded full details. The Doves Bindery produced 828 bindings before closing to outside work in 1909. 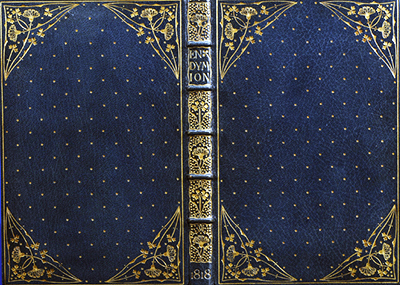 This binding, number 123 in Tidcombe's chronological catalog, was bound on October 9, 1894 for acclaimed New York art dealer, philanthropist, and co-founder of the Metropolitan Museum of Art, Samuel Putnam Avery (1822-1904), who paid £18 for it. With original pull-off box by Doves Bindery. The book next passed into the hands of author, lecturer, bibliophile, political activist, etc. Louise Ward Watkins (1890-1975) of Pasadena, California, who, amongst her many accomplishments, was the first California woman to run for United States Senate on a major party's ticket. A married woman of means, she was an avid and discerning book collector, her collection second. perhaps, in quality (if not quantity) only to the library of her neighbor to the southwest in Los Angeles, Estelle Doheny (1875-1958). The binding recently returned to Southern California. [DOVES BINDERY]. 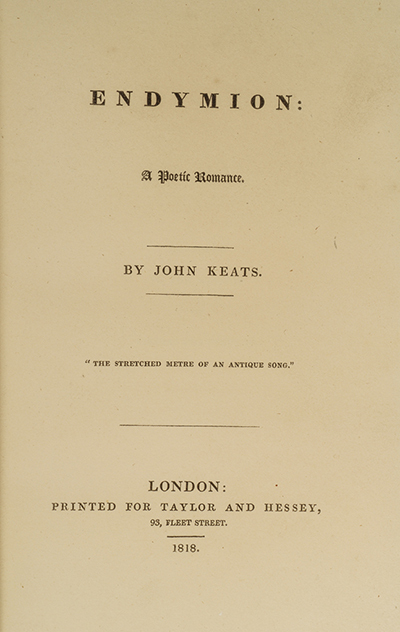 KEATS, John. Endymion: A Poetic Romance. London: Printed for Taylor and Hessey, 1818. Accurate color reproduction is always a challenge, and the actual hue of the binding is that seen in the double-spread image of the spine foot. That is amazing. I forwarded this to my mom and two sisters so they could share my excitement. Oh how I would love to have this in my library, especially since I'm reading Frankenstein and have been thinking about the Romantic poets a lot lately. I have not seen that tasty gauffering before- the tooling is so delicious and potent yet with so few tools. anyway, could go on but thanks for this lovely post. These are gems.